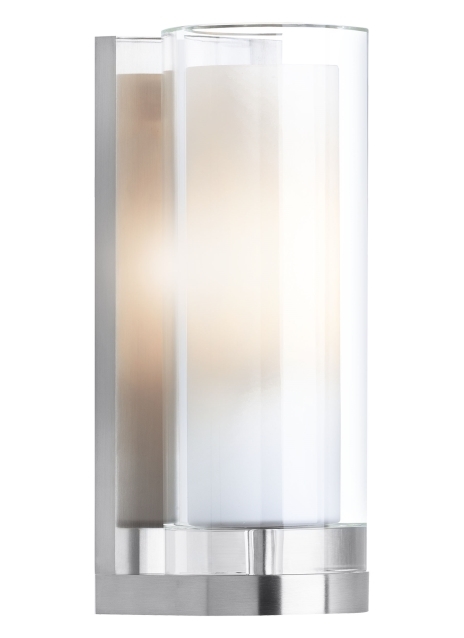 The Sara wall sconce light by Tech Lighting is simply elegant with its pure crystal shade and hand-blown glass diffuser. The Sara is cut from a solid block of crystal and formed into an elegant cylinder which surrounds the hand-blown inner white glass diffuser. This solid sconce sits on a die-cast metal base further enhancing the sophisticated and polished design. The Sara comes in three on-trend finishes Antique Bronze, Chrome and Satin Nickel. Scaling at 10.7” in length and 4.7” in width the the Sara is ideal for bathroom vanities, hallway lighting and bedroom lighting flanking two end tables. Available lamping options include compact fluorescent no-lamp, leaving you the option to light this fixture with your preferred lamping. The Sara is one of two elegant fixtures in the Sara family, simple search for the Sara to find its closest family member. Instantly elevates any space. Rated for (1) 60w max, E26 medium based lamp (T10 lamp not included). Fluorescent includes 120 volt 26 watt GX24Q-3 base triple tube compact fluorescent lamp. May also be lamped with 32 watt GX24Q-3 base triple tube compact fluorescent lamp (not included). No Lamp version dimmable with standard incandescent dimmer.